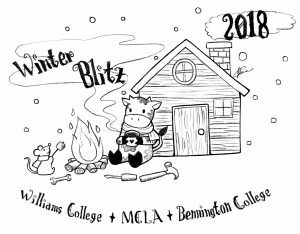 On Saturday, November 11th, almost 150 students from Williams College, Bennington College, andMCLA participated in the eleventh annual Winter Blitz. The Zilkha Center supplies the event with weatherization materials, including spray foam, reusable window kits, door sweeps, and pipe insulation. Participating students worked in teams to weatherize 40 houses in the community, including houses in Williamstown, Pittsfield, Bennington, and Shaftsbury. Teams were composed of a team leader, who received extra training, and two or three other students. The Williams Women’s Ultimate Frisbee team and the Men’s Rugby team as well as multiple entries also signed up to weatherize houses. All participants wore t-shirts designed by Julia Choi ‘20. Winter Blitz organizers pose for a photo after a day of training and set up practice. Weatherization helps reduce energy usage and heating bills for families in the community. We are also able to track the carbon emissions reduced by weatherizing these homes – less fuel is needed to heat better insulated houses. Most importantly, the Winter Blitz weatherization day of service provided participants the opportunity to build connections with members of the community and with students from other schools. The event was followed by a pizza party, and students reported having a great time getting to know each other and community homeowners better. This year’s Winter Blitz was a huge success, and the Winter Blitz Planning Committee is already excited for next year’s event!